Back in August I related a story about the Bernardo General Store, which served the farming village of Bernardo, which was located about a mile south of today’s Westfield North County mall. The store also contained the town’s post office. The town had been emptied out by the early 1920s and all traces of its buildings were gone a few years after that. The founding of a post office, as well as its relocation or closing, marked an important point in the history of a community. An important source for my research on local history has been the website of the National Archives and Records Administration (NARA). 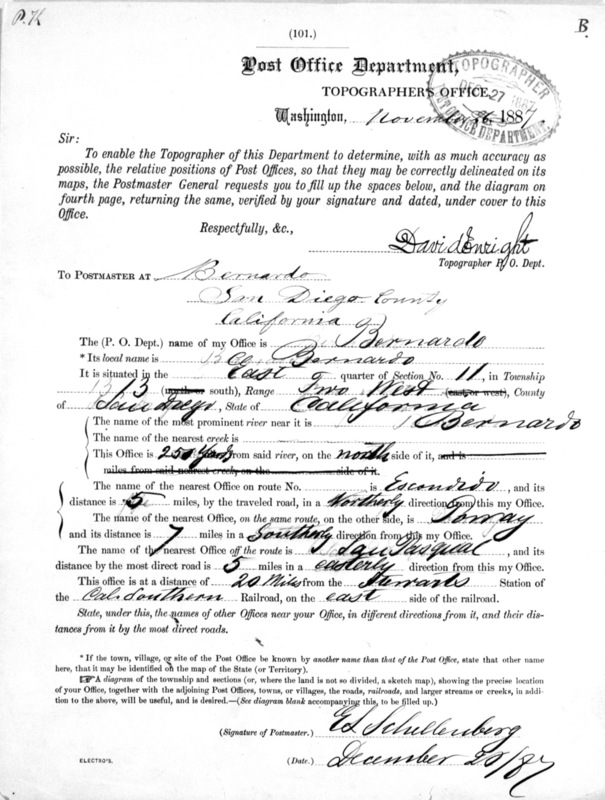 Readers may remember my references to “Appointments of U. S. Postmasters, 1837-1950,” which is a NARA site available to subscribers of certain genealogical websites. I recently discovered another NARA site which has been made available by NARA directly to the general public, “P. O. Reports of Site Locations, 1837-1950,” https://www.archives.gov/research/post-offices/locations-1837-1950.html . The records on this website are chiefly forms sent out by the topographer to postmasters across the country to determine the exact locations of their post offices in relation to neighboring post offices, transportation routes and facilities. History seekers can find similar information about post offices all over the county as well as across the state and in other states and territories. A lot of history available here! Check it out! Hi Vince: Great find! How nice not to have to go to the library to use Ancestry, etc. Thanks! Perhaps you know this, if not, you can get newspaper.com through the Carlsbad library site. You can call in for a temporary password number (I called the Circulation desk). Then within two weeks they ask that you pick up the real deal card. In their eresearch menu, you go to Genealogy and select Newspaper.com. The selection of papers are not that great, however, one never can tell what show up. Attached is a sample of my clip and save. f.y.i. and hi to Peggy.